I never really pay attention to coupons that arrive in the mail. Hey, most of them are for things that don't immediately impact me. You know, coupons for cleaning gutters, built-in vacuum units, transmission repair, knives and the sort. It goes straight into the recycling... until I find water streaming down the side of the house. I guess I shouldn't have thrown the gutter coupon out after all! Along with those "straight-to-recycle" coupons are a few ads for restaurants. I do admit to checking them out from time-to-time. For some reason or another, the coupon for Roman Ristorant e caught my attention. Sure they had some dinner for 2 deal which looked pretty good. But it was the promise of big plates of pasta at a good price that sealed the deal. Now, when we think of large plates of pasta, inevitably places like Anton's and Amorosa come to mind. Honestly, I do not prefer large plates of overcooked pasta with enough sauce to drown it. Rather, I'm of the belief that pasta should be al dente tossed with just the right amount of sauce for flavour. Personal preference really. Originally, I tried to get the hockey team to join me after an early game; but no dice. Gadget Girl had a food voucher for the Thirsty Penguin upstairs at the rink. No offense to the Thirsty Penguin; but one blog post is enough. Thus, I had to go with Plan B - gather up enough people to try more than one plate of pasta. So we met up with Vandelay, Donna Chang, Whipping Girl and Rich Guy for some Italian eats. Once again, it's nice to have willing diners waiting to be put into active duty on the roster. We were a bit late arriving, so we left the ordering up to Vandelay. What we started with was a large Roman's Caesar. 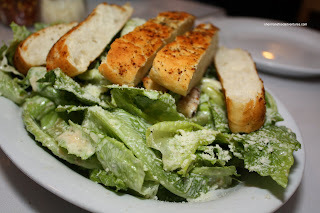 The salad is inde ed large with crisp romaine and a house-made dressing. It's such a shame that there was a lack of acid and saltiness that we look for in a Caesar. Not enough lemon juice and anchovies? I did like the Focaccia bread though. After a relatively long wait (small operation, it's forgivable), our 2 pizzas arrived. 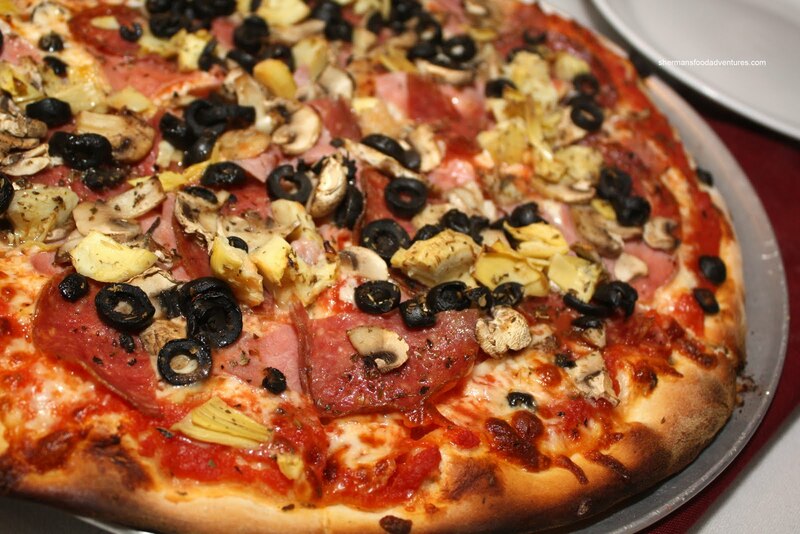 The first being the Capriciossa with tomato sauce, salami, ham, artichokes, mushrooms, black olives, mozzarella and edam cheese. This was not too bad. The thin crust was crispy, if not a bit dense and the toppings were plentiful. 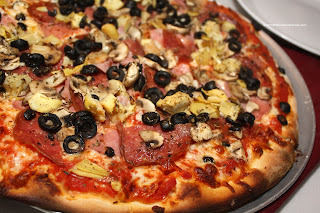 However, once again, there was a lack of salt - both in the dough and the toppings (which is strange since most of the items should have salt). 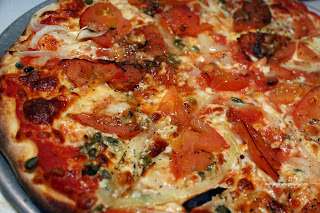 Now with that in mind, the Caprese consisting of tomato sauce, fresh sliced tomatoes, boccocini, onions, capers, basil, mozzarella and edam cheese, was super bland. 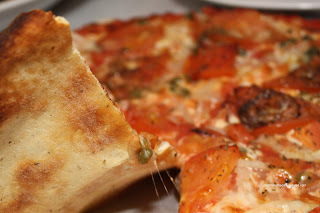 Sure, I'm aware that this pizza is not suppose to be ultra savoury due to the lack of meat; however, it was bland even though we were expecting it. It also didn't help that the pizza itself was quite wet. Our first pasta was the Linguine alla Vongole. I'm sure Vandelay ordered this for me since it is my favourite. Pictures cannot do this large plate of pasta justice. It is really big. Think nearly Anton's big. I appreciated that there was not too much sauce in the pasta; yet once again... this was bland. I could not taste the clams, even though I saw them. I tasted fresh tomato, some wine and garlic and not much else. Furthermore, the pasta was cooked a tad too long. It was probably al dente when removed from the boiling water; but was no longer so after being tossed in the sauce. Honestly, if they added just more salt, this would taste good. 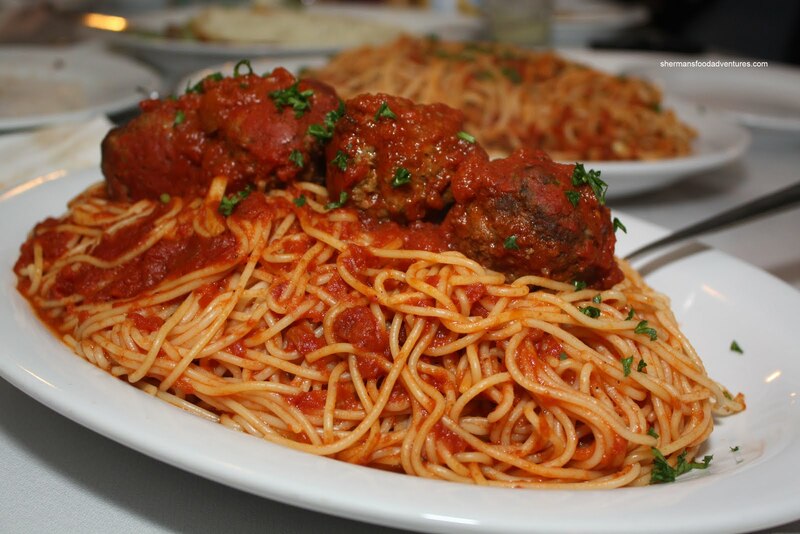 Now you can probably guess what I'm going to say about the Spaghetti & Meatballs... Needs salt! Once again, the pasta was past al dente and in dire need of flavour. I liked the fresh tomatoes in the Pomodoro. I know it is not supposed to be ultra flavourful; but at the same time, it needed something extra. I liked the meatballs. They were moist, surprisingly seasoned and meaty. 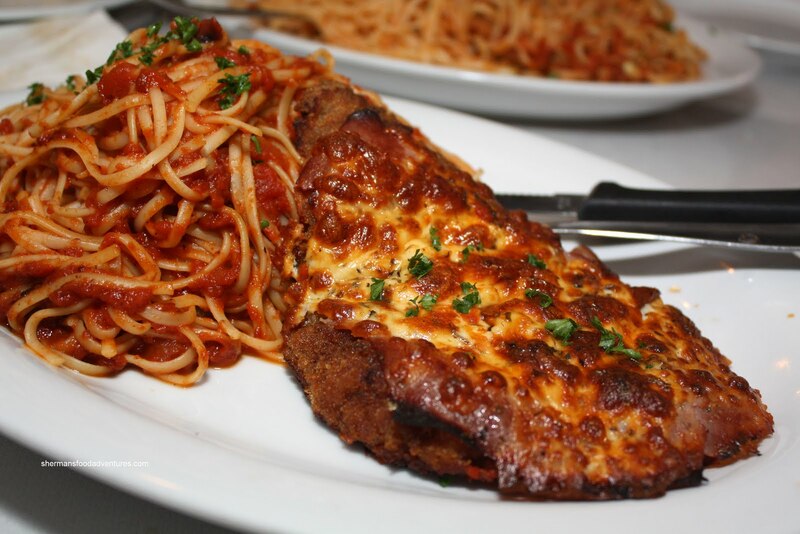 Our last dish was the Veal Parmigiana (breaded veal topped with ham and mozzarella cooked in tomato sauce and hot oven served with linguini tomato sauce). I was a bit confused with the ham - kinda resembled a Veal Cordon Bleu with tomato s auce. No real issue though because it did taste okay. The veal was not exactly tender; but was not overly tough either. Let's just say "ditto" to the side of pasta. Now with my whining about bland pasta, you'd think I'd immediately click "I don't like" on Urbanspoon. Wait a moment. The food wasn't terrible. It was just underseasoned. As an update, I returned for another visit with Costanza and asked for more aggressive seasoning and the pasta was fantastic. 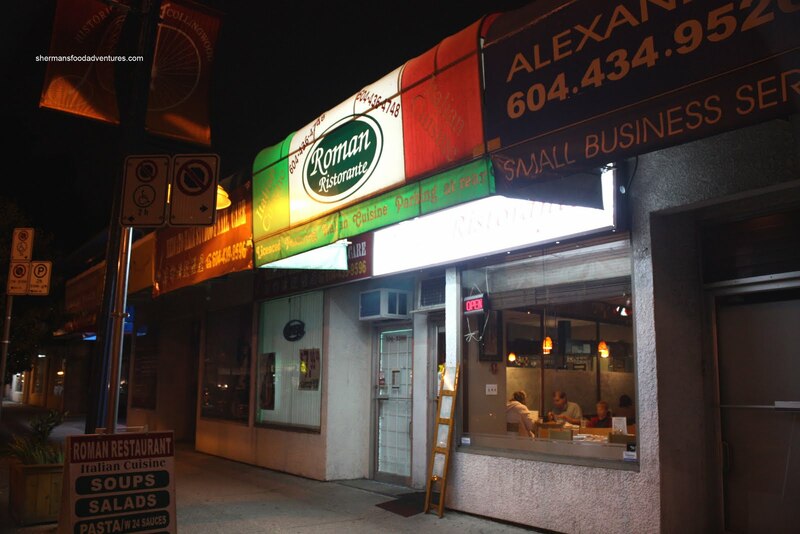 Considering the gigantic portions and reasonable price point (for the pastas, not the pizzas) combined with personable "family-owned" service, Roman is a much better choice than Anton's. Actually Kim it was not an off night. Costanza has been there a few times and this is the norm. But then again hr just asked them to add more salt. 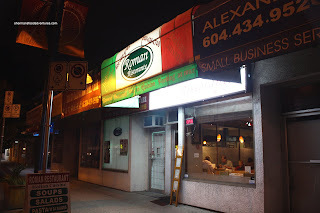 Funny, I drive on Kingsway twice a day on my commute, but have never seen this restaurant awning. I guess being 3000-block it's around Joyce and there's simply lots of small mom-&-pop shops in that area that can be easily missed if driving by. I agree with Kim. You can always add salt, but much harder to take away. I'm suspect of restos that over-salt their foods .... either trying to hide something or simply have dull taste buds. Food looks quite good ! Do you know if they are open for lunch ? 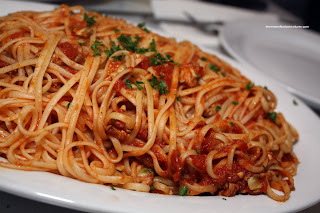 What were the pasta prices like generally ? LR, I totally agree, as I mentioned, lack of salt can easily be rectified. Bad food cannot. Prices are actually very good. A large is only $14 and that can feed 2 people easily. Yah, the place is very small. Easy to miss. Right across the street from Safeway. Well I finally made it to Roman. Bought two take-outs ..... classic lasagna and salcissia linguine with cream instead of tomato-based sauce. Fast fwd 20 mins to get home for dinner. Lasagna was pretty darn good. Hearty egg noodles, with a very meaty sauce, topped with a bechamel sauce. The salcissia linguine was ok but missed the boat on the sausage part. Too few slices, and they weren't spicy as advertized. But the dish was definitely garlicky enough, no problemo there. With a 10% discount for cash take-outs, this was a pretty darn good value. There's 'nuff food for us three for tomorrow's lunch, and then some. Yes, the light-handedness on salting was conspicuous. But I'd rather season the food myself at home than regretting too-salty dishes to start with. Yup LR. Salt can be added. Hence, with the large portions, a definite gem.